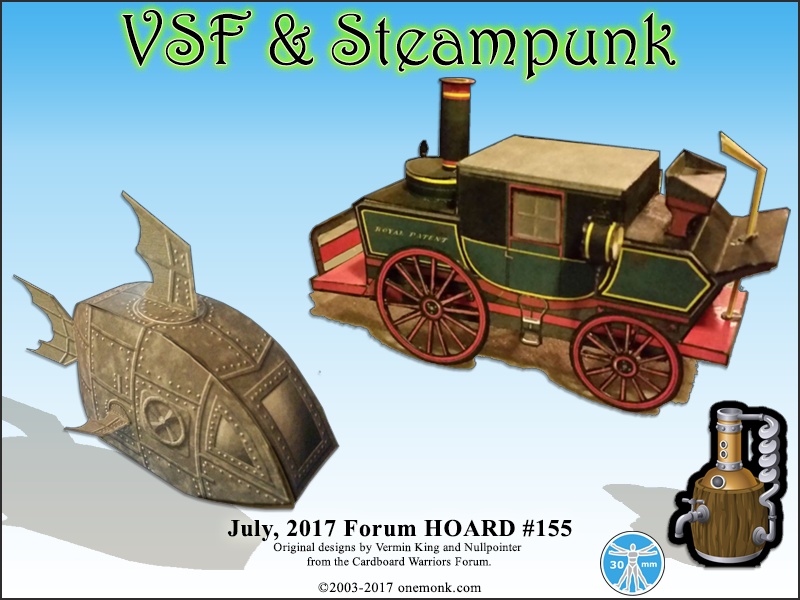 Forum Hoard #155 - VSF & Steampunk! The Cardboard warriors Forum Hoard #155 - VSF & Steampunk is up! 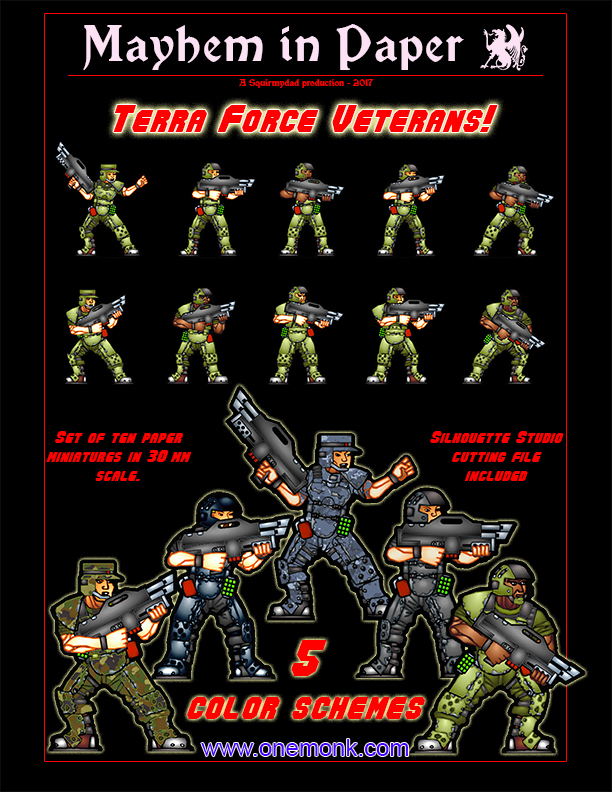 The Terra Force Veterans have been upgraded and are now available in five different color schemes! "What do you use these for?" - Most frequently asked question I've heard in regards to paper models and miniatures. 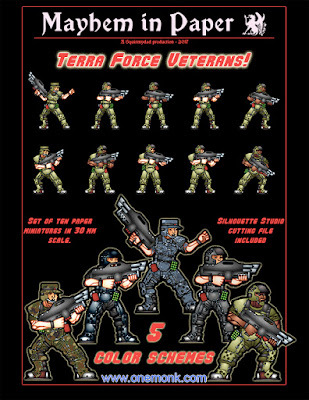 Do you want a free pre-printed and pre-cut kit of paper miniatures with foam-core bases and a dandy little tuckbox? Because I'm giving them away! But only if you write a scenario that is based on one or more kits from the Mayhem in Paper/One Monk Miniatures line. Write a scenario and get a free kit; simple. 1) Feature any kit from Mayhem in Paper/One Monk Miniatures. 2) What game system the scenario is set in. 3) Stats for the pieces involved in the scenario. 4) If terrain is important then a drawing of the scenario setting would be handy. Enter as many times as you wish by posting to; This Thread . Each time you post you can pick one of the kits from the pre-print page, there are two prints of each of the kits shown, supply is limited. "What's the catch?" "Why are you giving away kits that people would pay for?" The longer story is that I put in a great deal of time and effort last year preparing these to sell them at an anime convention that I'd been a vendor at for three years. Sales and acceptance had been steadily improving over those three years and I thought that the fourth year would be the bug breakthrough year for me and that the pre-printed and pre-cut sets in nice boxes would be my breakthrough item. Last year's sales were abysmally bad. I came home from the convention going "WTF?!?!" I threw all of my convention supplies in a big plastic bin and locked it away for a year. The convention is at the end of the month, I won't be attending this year. But someone should have the opportunity to play with these kits, and that's why I'm doing this. All of the photos and entries from the 2017 Papercuts Showcase are now up at http://onemonk.com/papercuts-2017.html Enjoy! Papercuts 2017 Best in Show voting! 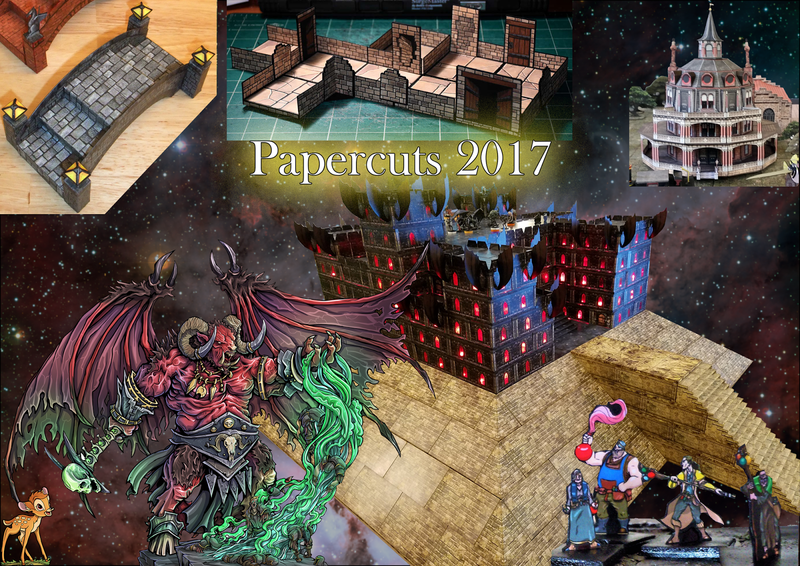 Papercuts 2017 - Go vote! Voting is open for Papercuts 2017!